The Walmart Beauty Box is a quarterly beauty sample subscription box from Walmart. They feature brands you will find at Walmart, plus coupons. You can sign up for both like I did – just change your birthday year for the different account. Check out my post on the Trendsetter and Classic options to see how to get both options. This is a review of the Trendsetter Beauty Box. Looking for more beauty boxes? Check out our list of the 31 Beauty Subscription Boxes to Try in 2017! I’m always happy to receive facial wipes in a subscription box! I’ve sampled these wipes many times before, and they are great! No fragrance added, gentle on my skin, and works on waterproof eye makeup – all good things! Voila! This set included 30 regular nails + 6 accent nails. I liked how easy it was to do (and easy to take off), but the squoval shape wasn’t for me, and it still felt a little weird wearing nails on my nails! These sponges are designed to help remove masks. (So smart!) I love clay masks that tighten as they dry, but they can be a bit of an ordeal to fully remove. I used a sponge with a little warm water and it was so much easier! I always appreciate when a subscription box includes both the shampoo and conditioner from the same line so you can get the full experience. I found the formulas to be good for drugstore brand hair care – nothing too special, but worked well! My first thought when I saw this in the box? Skip! But, since I want to try everything before I write a review, I decided to give it a go! Thanks, Walmart! I would never have tried this hair product otherwise, and now I’ll be using it on the regular! This body moisturizer is fragrance-free, lightweight, and absorbs quickly – all good things! This product is new to me and I’m happy to see an organic brand in the box! (And bonus points for the lavender scent!) The formula is designed to help reduce the appearance of scars and stretchmarks, too. Verdict: This box has a value of about $14. That’s good for a $5 Beauty Box and much better than the Classic Summer Box in my opinion. Plus, this box included a few new-to-me items that ended up being great discoveries! What do you think of the Summer Walmart Beauty Box? Did you get the Classic or Trendsetter box? 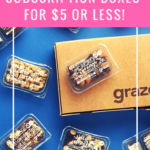 Check out our reviews of Cheap Subscription Boxes for other similarly priced subscription boxes! Ladies DO NOT WASTE your money. I bought this box. And recived exactly 5 items. All I got was a shampoo and conditoner sample size. Body lotion sample size. Hair spray sample size. And the sponge mask removers. This cost wise comes out to more than what these items would have cost if I bought them at the store. How is this a deal or a bargain? All the pictures showed people getting more than 5 items. I feel like this was such a waste of $5 and that’s saying a lot because it’s just $5. But seriously could get the exact same thing for free. There was no deal to thus whatsoever. Five crappy samples worth way less than $5 for 5 dollars. What a scam. They lie about the contents of the box and do not send what the sent to everyone else. I got this box I got a brush cleansing gel/Banana Boat sunblock/ Soo AE mask in place of body oil and nails….which I was sooo happy with the switch….I will use all 3 of the replacements before I would use body oil and I don’t use nails. I’ve subscribed to this box and an additional gift box for a friend, who has recently moved. I cannot get to the login page to change any of her information or see my account. Is anyone else getting an error when trying to login to the Walmart Beauty Box page? Honestly, I can’t imagine anyone complaining! These are FAB Boxes, for 5 bucks! You get so much for your money! So for those don’t like them, goodbye! lol More for the rest, of us, who really value them. What is your definition of “good work”? I they sent two Classics boxes, I happy because they came with bigger sizes of shampoo and conditioner, deodorant, and toothpaste. But, I was curious about the nails so I just went to Walmart and bought some. I have to say, they look like I got them done at the nail saloon. Plus I have been wearing them for two weeks, and they have not popped off. If your on a budget and can’t get your nails done, I recommend getting them! This is a great idea! I mean, I can afford a manicure, but the closest nail salon for me is a 40-minute trip, and the nail polish lasts, like, a day. I prefer gel manicures, but they do a lot of damage if done repeatedly. If these nails last two weeks without damaging my nails (and are less than 1/3 of the price), I’ll be stocking up! Mine was great and my first one ever. I picked the younger age group. I got basically a basic travel set all in one which I’m happy for yay vacation! Anyways I got dove dry shampoo volume &fullnesd 1.15oz, Pantene pro v dream care shampoo and conditioner 3.38 oz, ban roll on deodorant 1.5oz, Burt bees milk and honey body lotion 1oz,got2be ultra glued styling gel 1.25 ,Colgate radiant toothpaste.07oz and finally soapbox sea minerals body wash 2oz. I’m so glad I didn’t get nails (I do my own acrylic) and I’m doing good on sponges 😊 Oh I also got the coupon for the teeth thing. Luckily none of us need it. I got my box today. It only had a small sample of Pantene shampoo and conditioner, 2 pack of Mask remover sponges, Secret deoderant and coupon for $40 off some kind of tooth tray. i think i got ripped off but then again it was only $5.00…. My two cents. I’ve subbed to these Walmart boxes for a while now, I’d have to say a couple years. Sometimes the Trendsetter version is better, and sometimes the Classic is better. I wouldn’t necessarily rush out to cancel one over the other. It seems like every time a box is reviewed and one of the boxes is better than the other (and I agree, one of the boxes IS better than the other), but it’s not constant, I think last time the Classic box was better. That’s why a lot of us sub to both. You could think of it another way, if you decide not to sub to both, every other time or so, you’ll have a fun box, and on the rotating times, it will just be ok. Hey, it’s a $5 box. No biggie. Before I decided to just sub to both, I kept changing my sub from Trendsetter to Classic all the time after reading the reviews, and don’t you know it, I was on the opposite rotation, I think, of the awesome boxes! thanks for your input! I was wondering if I should switch to the Classic box from the Trendsetter since this summer box was pretty disappointing, I usually don’t get the “good” stuff that others and those who review the boxes would receive. I wonder if the new survey will really help them to curate the boxes better to what we like. I still have not received my fall beauty box! Is anyone else having this problem! This is sooooo much better than the Classic box, I’m so bummed. I used to get both, then i canceled one to save money, but I obviously canceled the wrong one. I hope I can swap for some of the hair spiking gel, I haven’t bought any yet for my new fuchsia mohawk (srsly!) Also, how cute is Eric! You didn’t necessarily cancel the wrong one. I got both classic and trendsetter and literally got two of the same exact box. The contents didn’t match either box review. I posted a few comments down with what I got in both boxes. Haven’t tried the sponges yet…..they better be awesome cause they look like someone cut up a kitchen sponge. Lol Will try them tonight. I received both boxes and did not receive nails (No biggie) or the sponges (disappointed) or body oil…my Trendsetter box was packaged nicely but classic was thrown in a box…no tissue…. I got everything but the nails. A little disappointed because I wanted to give them to my coworker. Just went to Walmart beauty box using link-said it is changing and now using a beauty profile of 8 questions. Is this new and do we all need to do an update to customize our boxes better? So many complaints on these sites about the box but it is only $5!!! Please see what is going on-thanks!! I saw that, and it sorta made me chuckle. I wonder how they are going to customize anything when the way they fill these boxes is so random in reality. I don’t know if it actually means anything – personally I am unsubscribing because these boxes bring more frustration than joy, but I’ll follow the spoilers and discussions in the future to see if things are changing. maybe i’ll re-up this fall…if i know this has been fixed! i loved the boxes, btw…i’m upset! Great review Liz!! Thank you! I agree 100% Tammy. The people that have had Subs seemed to be last. I would not have been upset, if we all got the same thing, or close to same!! And the mailing had been consistent! Walmart May not mind losing long time customers, after all, they received alot of New customers that are happy. I am happy for those who got their full box in a timely manner. I remember that Joy. And you all did nothing wrong. In June I kept seeing charges on my bank account, then it would be gone. After repeated emails with zero response, I cancelled. But Was charged 3x for both boxes, and I have yet to even get a trendy box! I honestly did not know if I would receive a box or not. My concerns were all the charges.. I would rather have my money than another crappy box!! I subbed for trendy and classic. After I cancelled, I received the Classic which was all what I got in Spring! !- Dove dry shampoo, sunscreen, ban deodorant, toothpaste…5 Items! Not 7!! When I was trying to navigate the new site, the Men’s box kept popping up, I could use it for gifts… but only if it arrives! I had also ordered the baby box (separate account. They said in pop ups they can not have different types of boxes on 1 account) That was billed, shipped and received quickly. I did not tell my niece about it until I knew it was coming. And I hoped I would not be embarrassed when it arrived. Still need to find out what is in it. I will post later how that turned out!! Maybe in the future Walmart will be consistent and we can return. I really did enjoy their boxes. And until recently, if I had a question, a csa replied with in hours. I don’t know if I have ever met anyone that has used Got2b glued for its’ intended purposes, lol. Some use it on the hair to lay down edges or fly aways. Others use it with wigs to get it to lay flat. Either way, definitely make sure you don’t over use Got2b glued; it may be a bit drying on your hair. Great review of this box. I’m certain I’ve seen those Impress nails in another box this summer. I’m not psyched about an exact double, but if I had to get doubles, at least it’s a box chock full of travel sizes and full size products (deodorant) with no foil packets! They were heavy boxes! I got the exact box as you, no.nails, no face scrubber. This is my first box and whilr I’m satisfied I got my moneys worth, I’m not real excited about any of the products. didn’t care for the nails they were to long in my opinion and took them off about an hour after i put them on. felt like i couldn’t do anything with them on since they were so long put i have never tried fake nails before so thought i would try them. I have a question: how strong are the nails? Like, do I need to worry about them breaking off when I am pulling up my pants? Would you generally suggest putting them on after you are already showered and dressed and stuff? And how long do they last? So, I ended up taking them off at the end of the day since they just felt weird to me. Sorry, I can’t tell you how long they would have lasted otherwise! They did feel pretty strong, though! I didn’t have any issues with them breaking off – I had to pull each one off when I was ready to be done with them! Thank you very much, Liz! I tried mine for a week – no issue of any of them coming off at all! They weren’t shiny hard plastic either…mine kind of had a sturdy silicone feel to them in a matte pink. I took them off after the week because I had gotten some new polish I was dying to try out, and with all the work I do with my hands from cooking to cleaning (I own an antique store – constantly cleaning!) I was annoyed by the gunk that gets caught under the faux nail and my real nail. But all in all, it was a very pleasant press-on experience and fun to try! Thank you, that sounds encouraging. And the values are calculated on percentage of the full size, I’m assuming? If you went to buy these travel items, like the Pantene, you’d pay a buck or two for each one. I get both the classic and trendsetter and they were almost identical this time. I didn’t get any makeup which was disappointing. The nails I got would fit my dogs nail bed before mine. I too, was gonna pass on the spike stuff but now I have to try it. Great review. Thanks!! I got this exact box. I wasn’t too excited about any of it, but for $5 I’ll use the shampoo/conditioner travel samples and the lotion and sponges so nothing too disappointing. I have to say, the nails I got look extremely small — like child size. I’m hesitant to attempt them. Interested in trying the sponges but I received the classic box and after the disappointment of the last two I cancelled. I may sub again next year for the trendsetter. Walmart’s boxes are just too inconsistent. I got the same box and thanks so much for the tip and info on the spiking glue. I was trying to figure out who to give it to (it’s summertime so some friend’s sons have “freedom mowhawks” going on…lol) but now I’m going to try it myself. I can use all the volume I can get! Brilliant! And this is definitely the perk of sub boxes…trying stuff you might not otherwise. Just not happy with my two Walmart boxes and haven’t been for a while so I canceled both. Mostly happy with this box, though not a fan of the nails. Always damaged my nails in high school with the glue on fake ones though I liked them at that age. I looked into that smileshop “coupon” and all I can say is that it looks borderline scammish. I’m willing to bet they paid Walmart to have their “coupon” included and Walmart, being Walmart, won’t say no to money. What a shame. I’d rather have a coupon for an item in the box or similar product sold in their store if they’re going to include that kind of stuff at all. But overall, not bad for $5. I ordered the classic and trend setter boxes and both were the exact same! I’m actually not disappointed though because I didn’t want the nails. Each of my boxes had 100ml Pantene shampoo and 100ml conditioner, a really big ban deodorant, dove dry shampoo, 1oz burts bees lotion, travel toothpaste, 2oz body wash and styling gel. I’m actually really happy with this box as I’ll take all of that on my next trip! The only thing I won’t use is the gel, but other than that I’m thrilled with all that for $5 and no fake nails!! I’m more happy with these than my glossybox and Sephora haha! Got this box because of the nails for my teen daughter. She got all the junk from the classic box and none of the nails, sponges or got 2 B…so cancelled subscription after opening. Don’t need 2 boxes full of the same stuff. am DONE with the Walmart box. I got the same box yesterday. Excited to try the sponges. I got the exact same box. :) I do prefer this set of nails as opposed to the red blue with anchor design. There are definitely variations for this box. I didn’t get the nails (thank goodness) but got a sheet mask instead (big yay!). I also got a Banana Boat Dry Balance sunscreen and instead of the oil sample, I got a brush cleaner sample. No wipes for me though. Has anyone looked into that Smile Club coupon? This is exactly what I received in my Trendsetter box as well! Except the nails are a different design (more glamorous, I’d say). And I love the squoval shape! Thanks for the tip about the spiking glue, it would have never occurred to me to use it that way. "Ya, I can see that. I definitely could see any of them getting a lot of heat of they did a perfume only box. I k..."